Gallery of images from the YouTube series Cobra Kai. 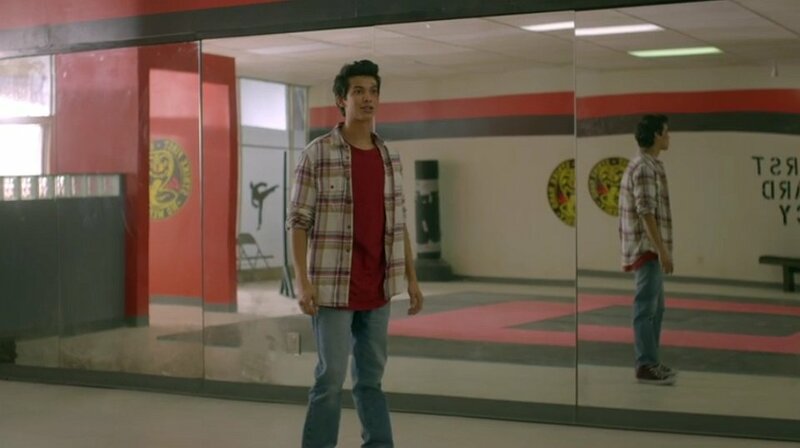 1 Cobra Kai Miguel walks into Johnny's dojo for the first time. 2 Cobra Kai Our first introduction to Johnny Lawrence's neighbor, Miguel Diaz (Xolo Mariduena) wearing white chucks. 3 Cobra Kai Miguel must learn to sink or swim using only his legs and his white low tops. 4 Cobra Kai Miguel takes Amanda to Golf N Stuff for their first date. 5 Cobra Kai Close up of Miguel's white chucks during a training montage. 7 Cobra Kai Miguel often wears maroon high top chucks in the series. 8 Cobra Kai Miguel cleaning the karate dojo, shot 1. 9 Cobra Kai Miguel cleaning the karate dojo, shot 2. 10 Cobra Kai Miguel surprises himself and the school when he fends off the school bullies who were harassing Amanda. 11 Cobra Kai The students cheer Miguel after he defeats the bullies. 12 Cobra Kai Many background characters in the show also wear chucks, as in this shot where kids are wearing blue, red, rainbow, and The Who, chucks on a jungle gym. 13 Cobra Kai Several supporting characters sport their chucks in the training montage. 14 Cobra Kai Robby watches Daniel LaRusso raise the flag at his car dealership. 15 Cobra Kai Robby's initially not mopping right. 16 Cobra Kai Danny LaRusso demonstrates his own versions of wax on wax off to train Robby. 17 Cobra Kai Robby practices mopping the LaRusso way, shot 1. 18 Cobra Kai Robby practices mopping the LaRusso way, shot 2. 19 Cobra Kai Robby trains with Danny LaRusso, the original Karate Kid, out on a pier. 20 Cobra Kai Robby's tree practice. 21 Cobra Kai Robby wears black high top chucks in the series. 23 Cobra Kai Robby wears his black chucks to the skate park. Cobra Kai is a Drama/Action series broadcast from May, 2018 on YouTube Red. Set thirty years after the events of the 1984 All Valley Karate Tournament, the series focuses on Johnny Lawrence reopening the Cobra Kai dojo, which causes his rivalry with Daniel LaRusso to be reignited. Two teen protagonists in the series wear chucks — Miguel Diaz (Xolo Maridueña), the kid who inspires Johnny to start up the dojo, wears maroon high tops and white low tops, and Robby Keene (Tanner Buchanan), wears black high top chucks.